Because I’m a Canadian who travels in somewhat international literary circles, I am sometimes asked to explain CanLit. Because Canadians are an enigma internationally, aren’t we? Everyone talks about how polite we are. How unassuming. Sometimes they ta lk about how much we like cheese. And then they encounter the fiction we identify as the literature that represents us -- CanLit -- and they’re not quite sure what to make of it because it throws who they thought we were out of focus. That’s because the fiction that is most typical of the title is connected, in a way. Certain names spring to mind. Jane Urquhart. Carol Shields. Margaret Laurence. Timothy Findley. David Adams Richards. I could go on, but you get the idea. The work by the writers in this list is lyrical. Often understated. On the surface there is beauty and everything seems just as it should be. It’s great writing, by most standards. But you don’t have to look far beneath that surface to see the snakes the writhe just below. It is no work at all to add Elizabeth Hay to that list, either. She’s got the right CV and she certainly has the chops. Her last novel, Late Nights on Air, won the Scotiabank Giller Prize and those of us who have been watching her knew it was only a matter of time before that happened. Knew, also, that the best was yet to come. Alone in the Classroom (McClelland & Stewart) is that novel and, as I read it, I couldn’t help but think of how typical it is of the type of reading that gets shelved as CanLit inside of Canada. Shelved and then celebrated because this, my friends, this is CanLit. Early August. The jewelweed was in the air. Every child felt it. She was aware of precious time running out. 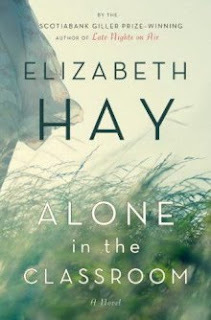 Hay evokes first beauty then fear as she explores the connections between two women separated by generations: narrator Anne and her aunt, Connie Flood who, as a student, is both compelled and repulsed by the principal, Parley Burns. Between the two timelines -- Anne’s and Connie’s -- Hay obliquely examines the twinned natures of love and hate and how obsession can cross generations. I remember her book 'A Student of Weather' but then I've somehow lost sight of her. thanks for this pointer, I shall follow it up.